"Thanks to Michael Berry, we now have a common, cross-disciplinary language with which to discuss hip hop’s finer details and wider meanings. Addressing important themes of commercialism, gender, race, intertextuality, geography and much more, Berry has synthesized the ideas from hip-hop studies’ three-decade history into an accessible format that will appeal to both novice and hip-hop head." "Listening to Rap digs deep into the music, unpacking rap’s rich sonic and lyrical material. An eloquent guide to both classic and emerging voices, this indispensable volume is a welcome addition to any hip-hop lover’s library." 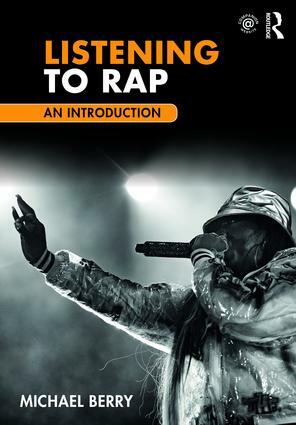 "Michael Berry has provided an accessible way to study and understand rap with both the beginner and expert in mind. Listening to Rap is an important contribution to the critical study of rap music." "This book gives the reader an outstanding framework from which to maneuver the universe of rap. Michael Berry covers it all from top to bottom. He highlights the new classics alongside the true old skool originals we've grown to respect. From Outkast to Juvenile and UTP to J.Cole and Killer Mike, Berry has modernized this conversation. I was blown away by this collection of thought and music combined."